Adebayo C. Akomolafe, Ph.D. is a young clinical psychologist, lecturer, and author, who is writing his second book, And We Shall Dance with the Mountains and a novel, The Boy Who Stayed Outside. Adebayo was invited to be the Coordinator of the International Alliance for Localization, a project of Local Futures. 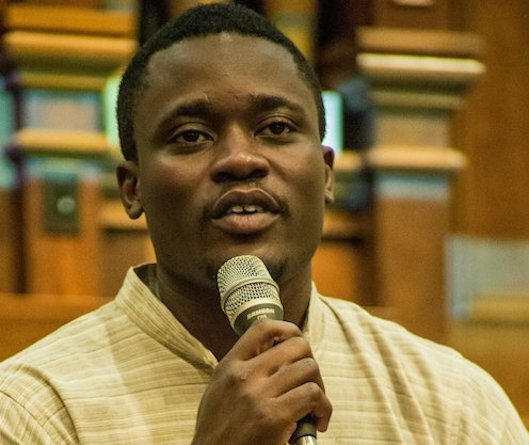 Bayo is globally recognized for his poetic, unconventional, counterintuitive, and indigenous take on global crisis, civic action and social change, and was recently enlisted as the recipient of the Global Excellence Award (Civil Society) 2014 by FutureShapers (California). He is Coordinating Curator for The Emergence Network. He is a young man with a growing, poetic and potent voice that has captivated audiences around the world. Bayo co-founded a network called Koru with his life-partner, Ej. His readings of ‘knowledge’, ‘development’, ‘progress’ and ‘truth’ as Eurocentric metanarratives led him to develop the first International Workshop on Alternative Research Paradigms and Indigenous Knowledge Promotion (WARP, 2011). His most abiding interests are the idea of civilizational transitions, localization, the multidimensionality and paradox of ‘reality’ and consciousness, and a radical planetary future. Ej and Bayo are ecstatic parents of a girl, Alethea.